Wheat Gluten is a protein component in which wheat is used to strengthen dough and give it structure and flavor. You can combine wheat gluten with millet or corn meal to make satisfactory baked products. Use three tablespoons per loaf of bread. This can also be used to make meat substitutes such as tofu or seitan. 2.5 lbs. Packaged in Sealed / Resealable Ziploc Bag . We recommend storing the pouch under dry conditions to maximize freshness. RTM Distributors is the only authorized seller of Medley Hills Farm Products. For your protection, select only "Sold by RTM Distributors" as the seller. Vital Wheat gluten is similar to soybean based products. This can be used to make meat substitutes such as tofu or seitan. It can also be used as a thickening agent in sauces and condiments. 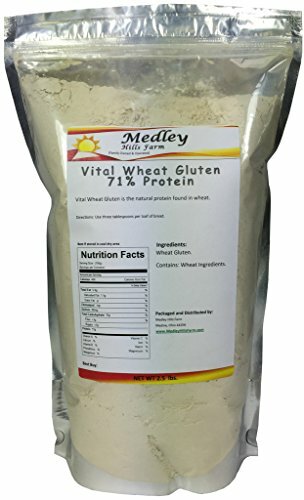 Vital Wheat Gluten is the natural protein found in wheat. A small amount added to yeast bread recipes improves the texture and elasticity of the dough. Vital Wheat Gluten can also be used to make a vegetarian meat substitute known as seitan. When mixed with with water and spiced, our Vital Wheat Gluten will make seitan, a vegetarian "meat" that is rich in protein. Our Vitor Wheat Gluten, which contains 71% protein, can also be added to regular flour to increase the content, resulting in high-gluten flour, which is ideal for baking chewier breads. If you have any questions about this product by Medley Hills Farm, contact us by completing and submitting the form below. If you are looking for a specif part number, please include it with your message.